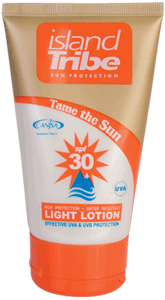 All Island Tribe sunscreens are Broad Spectrum which means they protect from both UVA and UVB rays and carry a boots 4**** rating. The SPF on our bottles is validated according to SANS 1557:2002, one of the most vigorous testings in the world. 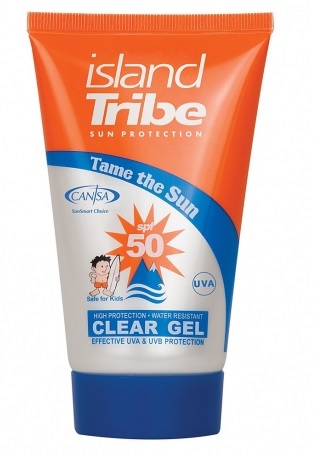 Island Tribe have ensured that all formulations have the highest possible UVA protection in them and have further enhanced our products with the wonders of Vitamin E.
The range of products caters for all types of sports enthusiasts and their families. The SPF ranges from 15 to 50 and all the sunscreens are Water resistant, tested for irritancy levels, approved and prescribed by Dermatologists widely. Island Tribe has surpassed the harshest of tests. Its unique Gel formula has achieved the esteemed MEDUNSA certificate and is endorsed by the cancer association of South Africa. This means that Island Tribe Sunscreen has been medically certified by the Medical University of South Africa and the South African Bureau of Standards (SABS 1557:2002). Such a prestigious international standard along with hypo-allergenic properties, neutralising sun filters, moisturising qualities and being highly impervious to water makes Island Tribe the sungods choice.